Robotic Arm, Completely Programmable and controllable through PC. PC software allows easy to use interface for movements and programming sequences. Once the sequence is programmed a program for Rhino Robot Controller Board or Arduino can be generated directly from software so that the arm can be controlled independently without PC. 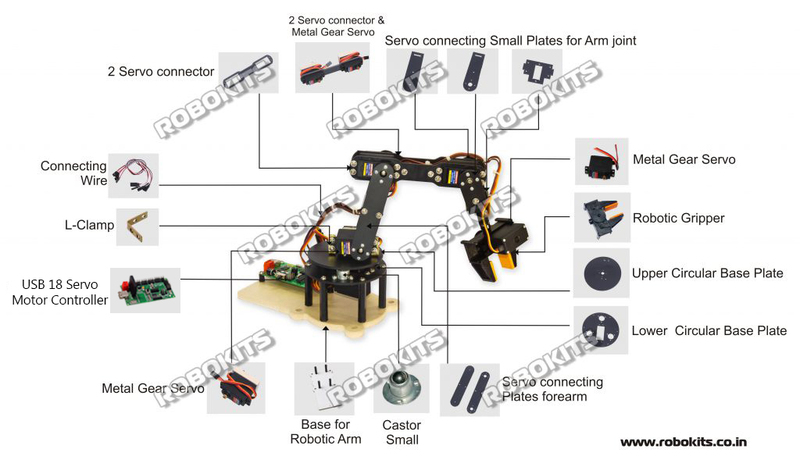 You can also control it through Rhino Robot Control Board, Arduino or any other microcontroller capable of driving 6 RC Servos to control the robotic arm directly. With optional Bluetooth module mounted on servo controller pcb - you can control the arm wirelessly over bluetooth from your PC. Apart from arm you can also connect extra servos to the controller.